Known for affordable commuter vehicles and people movers, Kia Motors is doubling down on two booming segments: the midsize SUV and the adventure mobile. The Telluride is the South Korean automaker’s first entry into the three-row midsize segment. The SUV is an economical seven-seater with boxy styling and off-road chops that will boost Kia’s larger-vehicle lineup, which comprises its Sorento midsized crossover and Sportage compact crossover as well as the toaster-shaped Soul. It will go head-to-head with segment heavyweights including the Honda Pilot, Nissan Pathfinder and Chevrolet Traverse. While the competition embraces its soccer mom image, the Telluride’s split personality will appeal to both the family buyer and the weekend warrior. As consumers are increasingly attracted to larger vehicles like trucks, SUVs and crossovers, Telluride’s versatility is important. A recent test drive of the Telluride through western Colorado demonstrated that it excels as a comfortable daily driver and has the necessary ingredients to be a viable adventure rig. 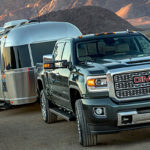 Those include available all-wheel drive with AWD lock, a 5,000-pound towing capacity, 8 inches of ground clearance, 87 cubic feet of cargo space and available roof rails. It’s also capable of handling light off-roading, as evidenced by its ability to deftly navigate rain-soaked and muddied trails during the test drive. Each of its four trims – LX, S, EX and SX – comes standard with the same 3.8-liter V-6 engine, which delivers 291 horsepower and 262 pound-feet of torque. Front-wheel drive is standard, and AWD can be added to any trim. All models have Apple CarPlay and Android Auto compatibility, six USB ports, adaptive cruise control and blind-spot monitoring. Available options include seating for up to eight, a 10.3-inch touch screen and Harman Kardon premium audio. During the test drive, Kia highlighted an AWD SX trim outfitted with a $4,000 Prestige Package, which adds premium leather upholstery, a heads-up display and a heated steering wheel. The package also includes heated and ventilated front and second-row seats, a rarity in the segment. The Telluride is the biggest vehicle in Kia’s lineup, stretching 197 inches in length and 69 inches tall. Its larger size didn’t prevent the SUV from delivering a nimble experience on winding mountain roads as well as bumpy, single-track trails. A smooth-shifting eight-speed automatic transmission performed effortlessly across Colorado’s varied terrain. This made highway driving comfortable and reduced the opportunity for excessive wheel slip in mud in between gears. However, there was an evident lack of power while attempting to pass other cars on both straightaways and climbs. The uptick in acceleration felt sluggish and took several seconds to become noticeable. The Telluride has four standard drive modes: Comfort, Eco, Sport and Smart. The SX was also outfitted with Snow mode and AWD lock, both of which are standard on any trim with AWD, which allowed it to be much more suited to off-roading. The SUV’s large, boxy exterior equates to a comfortable interior. There is ample leg and shoulder room for all passengers, even in the third row. The reclining and sliding second-row captain’s chairs that are standard in the SX lend even more room to the far back of the vehicle. Other interior features include power adjustable driver and passenger seats, a heated steering wheel and a dual sunroof. A 10.3-inch color display handles everything from navigation to climate control. The screen, which could be more responsive, has one-click access to commands like radio and media, but redundant hard-button controls perform the same tasks. They can also regulate the navigation and access the infotainment settings. One of Telluride’s most impressive features is the driver-assistance technology that comes standard on all trims. The suite includes blind-spot monitoring, forward-collision avoidance, pedestrian detection and rear cross traffic collision alerts. These warnings deliver visual and audio cues to the driver. Kia also includes a system called driver-attention warning, which monitors the driver’s behavior to assess inattentiveness or fatigue. If the system senses any distraction of this type, a small coffee cup in the dashboard display will appear to signal the driver to get off the road. Loud audio cues will sound if the driver becomes more inattentive. Other active safety technologies include lane-follow and lane-keep assist, lane-departure warning and adaptive cruise control. The adaptive cruise uses radar to follow the vehicle ahead and will come to a full stop and start back up without driver input. Many new vehicles have adaptive cruise, but most systems will shut off when the vehicle drops below 5 mph. Fully automated cruise control is very useful for eliminating driver fatigue in heavy traffic. The 2020 Telluride has a starting price of $31,690. The midgrade LX and S trims cost $31,690 and $33,990, respectively. The EX starts at $37,090, and the top trim SX costs $41,490. Each trim is available with AWD for an additional $2,000. Prices do not include a $1,045 destination fee. The $4,000 Prestige Package is available for AWD models only. As a midsize SUV, the Telluride could siphon sales from similarly sized Kias. Last year, sales of Sorento jumped 9 percent to 107,846 units, but as the auto market continues to show higher demand for larger vehicles, the dent may be negligible. Early sales figures may already be foreshadowing its success. The automaker said it has sold 3,000 Tellurides since February. Editor’s note: To facilitate this report, Trucks.com attended an event at which Kia hosted travel and lodging.